Earlier this week I had the privilege of speaking at a convention in Victoria, British Columbia. The topic was one near and dear to my heart – networking. 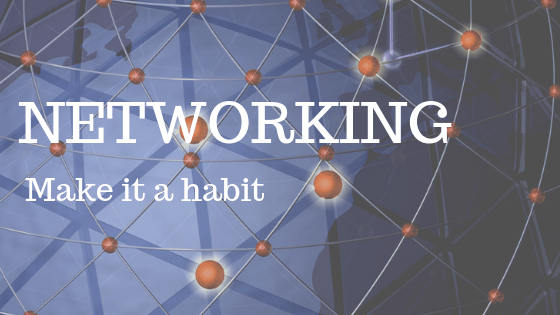 Networking is simply seeking opportunities to meet, interact with and form connections with new people. It’s contributed to my life in many different areas. I remember vividly how painful and uncomfortable it was for me to seek new acquaintanceships when I was first introduced to the concept. I am, by nature, an extreme introvert. Many of those who know me today would scoff at that statement. However, it took a long period of practice and self-talk to get comfortable meeting new people. Now, I even embrace all opportunities to do so. My life has been enriched by the people I’ve been connected to through someone who knows someone. My best-ever networking result began with my being pulled over and ticketed for speeding in Saskatchewan. That ticket was the first in a lengthy chain, culminating in meeting the most important person in my life, my wife, Gimalle. Each step in that chain is a story for another day. The point is my life is filled with wonderful relationships that came about because someone introduced me to someone else. I’m sure yours is too. None of this can happen unless you are willing to make these connections. I have come to determine that there are only three viewpoints people have regarding networking. The first is the person who seeks every opportunity for an introduction knowing nothing may ever come of it. They also understand a chance encounter can lead to a satisfying friendship, a profitable business relationship, or an opportunity for personal growth. This type of person is often viewed as an extrovert. This may be true, or the person may be simply someone who understands that all of us are better than any of us. The second type of person is the one who will reach out to connect with others out of a sense of necessity or obligation. This kind of person is uncomfortable in the role of meeting others, but will if they must. The third is the person who would rather undergo a root canal than connect with others. This person will do everything possible to avoid networking, because the discomfort from doing so is unbearably painful. I know of no easy way of overcoming this feeling, but I do know it is the product of the story we tell ourselves. If we tell ourselves that it’s difficult to meet people, nothing will change until our story about that changes. Many years ago, a wise man taught me a lesson that played a major role in overcoming my own inherent shyness. He taught me to always ask myself a question whenever I felt reluctant to boldly introduce myself to a stranger. The question is: How do you know? How do you know the person riding the elevator with you will not become the biggest and most important client you will ever have? Or that the lady sitting next to you on an airplane will not be to help you get the biggest possible discount on your office furniture purchase? How do you know the person at the next table could be the chiropractor who can magically make the back pain you’ve lived with for twenty years disappear and never return? The answer is, of course, you don’t know. And you will never know unless you make the effort to say “Hi” and begin a conversation. There is never a downside to introducing yourself to a total stranger. There is always the possibility the upside can be magnificently rewarding. So, network as if it could change your life. You never know. If the police officer giving you a ticket happens to know someone who knows someone who knows your future wife, it just might.